Hope Is My Anchor: Want to see our "School Room?" 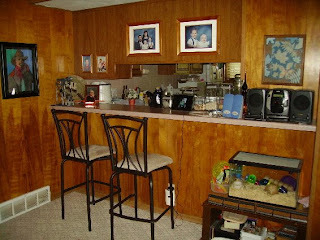 This room doubles as a family room/sitting room, and features our 18 year-old couches! (We found them one day when we went to Walmart for hairspray. Of course, I don't use hairspray, too allergic then & now so is Dave! but it was for an art project. Anyway, go in for hair spray, come out with couches, that's about how my life goes!). They've made it through 5 moves so far, LOL! You can see our magnet whiteboard with the All About Spelling tiles peeking out from behind the couch. Sometimes the kids do projects on the table. They used it a lot when they were smaller, it was just their size, LOL! That's my grandpa's fiddle music on the piano stand there, I love it! But I need to find a way to restore it, the pages are all falling out, any ideas? I have some Reddi Roll that I could protect the cover with but I'm more concerned about all the inside pages falling apart. Still need to go through the kids' art portfolios stashed between the book case and the hutch-turned-bookcase/school storage! On top of the bookcase you can see the candle setting from our wedding. We use that for "Tuesday Tea" when we read poetry & eat a snack. The top shelf (dubbed the "shelf of wonder" by Zac) houses our current year's books. 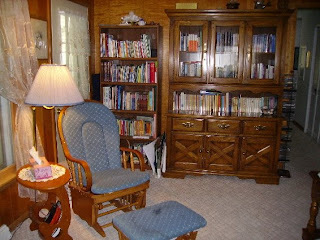 We usually do our history and science and Bible reading in this room. The kids like to write or eat breakfast here, and that's our buddy Lightning's cage down below (our hamster). The cowboy picture on the left is one Zac did several years ago in an art class. He was 7 I believe, and drew this while looking at a picture, then put black-colored glue on the lines & used oil pastels. That teacher was phenomenal at getting kids to draw! I know, I need to update our family pictures, I do have a more recent one, I just haven't gotten it up yet--and how could I take down those sweet cherub faces anyway? Sigh. They do grow! That is such a lovely place to learn, Merry! Great job! 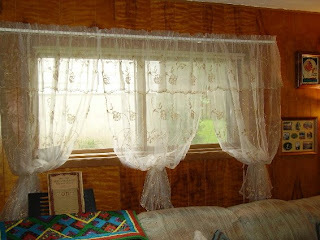 I LOVE the new curtains! I would never have guessed that your furniture is 18 years old. Wow, you sure take good care of your things! It was so comfy when I sat in it. Thanks so much for sharing! Merry!!!! I love the new curtains and the rearranging!! You are fabulous! What a great way to start a new year. Way to go! I'm a lacy-frilly kind of gal, too. Love what you did to your family room/school room. 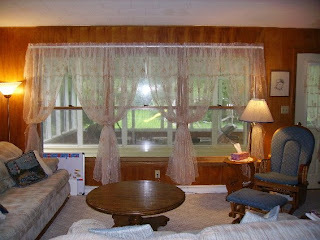 The new curtains look great! What a beautiful room! I've been organizing at our house, too--must be something we all feel compelled to do before school starts. Well done! Thanks for the tour, Merry! Your home looks like a warm and welcoming place to be. What a comfortable place to learn! Your updating looks great. I've also been doing some updating at my house. Wow, Merry! That is fantastic.